The majority of Cape Cod's land form was created by glacial activity several thousands of years ago. This consolidated land form rises above Sea Level by approximately 100 feet and is referred to as "Coastal Bank". The unconsolidated, Provincetown and Monomoy land forms, at opposite ends of the Cape, were created by the "Aeolian Process" of sand being eroded elsewhere and deposited by wind and waves. This section focuses on Coastal Banks and Safe Harbor's strategy of nourishment. Coastal banks, composed of consolidated sediments created by Glacial Process, only erode at the toe but can never be restored, once they have been eroded by wave and tide. Nourishment strategy may provide an alternative to the permanent loss of the coastal bank itself. By placing limited amounts of sand along the toe of the bank, erosion activity will remove the sand and not the bank. Beach sand absorbs wave energy. Eroding beaches may be resupplied by sand from the toe of a coastal bank. When the toe is used up, a new section of bank will collapse to create a new toe. This "Coastal Process" inexorably whittles away at the bay side Coastal Bank (and gobbles away the ocean side). Suppose we considered a solution that could be found within the problem itself. Using sand to renourish the toe of the Coastal Bank. The toe would protect the beach as well as the bank and could be renourished as necessary. This system could offer a low impact degree of protection on the ocean side coastal banks as well.The coastal process would continue and property owners would be buying time...with sand. This experience-based information is not intended to be completely comprehensive. The Glacial Process created coastal Banks and they can never be replaced or restored. Erosion events result from the interactions of energy and mass, these events only occur when a critical synergy of co-factors are present during storm pulses. If specific cofactors are missing, erosion will be less significant, or perhaps non-existant. We advocate non-structural, sand nourishment as a preferred management response to Bayside, Coastal Bank erosion. 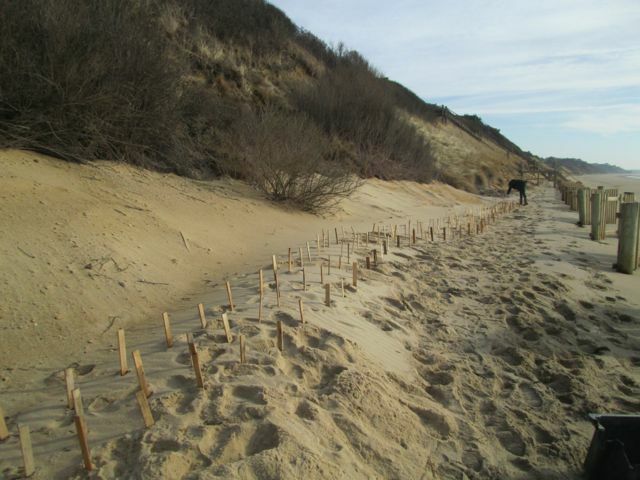 Sand is used sacrificially, protecting irreplaceable coastal banks. Sand is already a part of the coastal process. Image by G. Peabody, showing typical, Bayside Storm event nourishment loss = 1/3 cubic yard/linear foot. We recommend nourishing Bayside Coastal Banks with one and a half cubic yards of clean, compatible, sand nourishment per linear foot. We also encourage neighborhood groups to work together. This reduces costs and increases protection. Long duration storm pulses are greatest threat to erosion.